Patient: Milo, male-neutered, 10 years old, DSH (domestic short hair). Presenting Reason: Presented for not eating or drinking & vomited once. He is also lethargic and has been hiding under the bed, which is unusual for him. Physical Exam: A slightly low temperature was found (37.4°C). Tacky mucus membranes (gums) & a hydration status check indicated he was ~5-7% dehydrated. Milo appeared depressed – lying with his head down on table. A large, firm bladder was palpated indicating urinary obstruction. Milo was admitted for blood work, urinalysis, x-rays, IV fluids & sedation for placement of a urinary catheter. Blood Work – We run blood work to check on the status of the kidneys. When the urinary tract is blocked (and bladder is full) the kidneys can no longer filter out any toxins from the blood (such as nitrogen). This puts strain on the kidneys, causing the kidney enzyme levels to rise. Milo’s blood values indicated dehydration with severe azotemia (increased toxin levels), stress hyperglycemia (increased blood sugars), mild hyperbilirubinemia (increased bilirubin levels) and hyperkalemia (increased potassium levels). A CBC (Complete Blood Count) found slightly elevated RBC numbers likely due to dehydration. No other changes noted. *Note – BUN & Creatinine are kidney values. Phosphorus is excreted through the kidney, so the value will go up if not urinating. Stress can cause the glucose levels (blood sugar) to rise. Urinalysis – A urinalysis is checked to see if crystals or evidence of a urinary tract infection is seen. There are several reasons we can see signs of urinary blockage in a cat. Although crystals are a common cause (especially in male cats as their urethra is smaller than a females); bladder stones, inflammation (cystitis) or severe urinary issues can also be the culprits. The urine results also provide us information on kidney function. SAMPLE COLLECTION AND TIME: Collected via catheter at 11:30 am, analyzed immediately. Milo’s urine indicated struvite crystals were present, along with a large amount of blood. A small number of white blood cells & bacteria were seen, which could indicate a secondary mild infection. 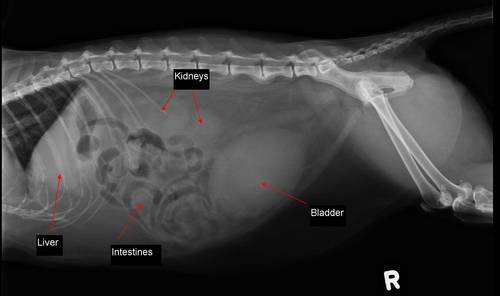 Radiographs – x-rays were performed to ensure bladder stones were not the cause of the urinary blockage. Milo showed no evidence of stones on his xray. 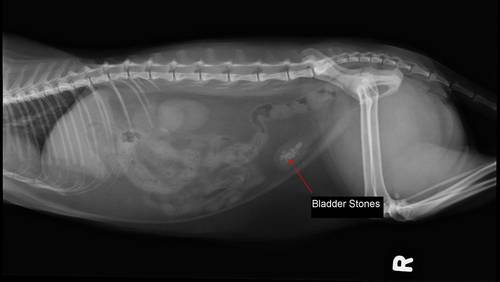 Below is an example of what bladder stones look like on an x-ray for comparison (these were found on a different feline patient). Also notice the size of Milo’s bladder above when compared to the other patient below. Diagnostic Plan: Milo was placed on IV fluids to correct the dehydration. IV fluids will also help flush the kidneys (allowing toxins to be excreted), thus over time lowering the kidney values. Milo was then sedated to allow the doctors to pass a urinary catheter into the bladder. His bladder was then drain of the existing urine (approx. 150mls of bloody urine was extracted). Saline was then flushed through the catheter up into the bladder & removed several times to flush out as many crystals as possible. The catheter is sutured in place to allow the inflamed urethra to remain open & continue draining while the tissues start to heal. 1. An anti-spasmodic medication, which will help relax the urethra muscles. 3. An antibiotic that was given IV while he remained on IV fluids (this is later switched to an oral antibiotic). This will eliminate the secondary bladder infection. 4. MediCal Urinary SO diet. This diet is specially formulated to dissolve struvite crystals & prevent them from forming. This is a diet Milo will remain on for life. He should not have any other diets added in or unauthorized treats as this will change the urine pH & potentially create crystals. Case Outcome: Milo remained in hospital (transferred between our hospital & the emergency clinic) on IV fluids & urinary catheter for 4 days. Milo’s urinary catheter was pulled at day 2, but unfortunately Milo re-blocked and another urinary catheter needed to be placed for 2 more days. During this time Milo recovered well – his hydration returned to normal, he started eating his new diet, and his kidney values returned to normal levels. We are happy to report that Milo had no problems upon going home & continues to do well. Thank you to Milo’s family for letting us share his story!